Even though Ethie castle is technically defined as a castle, due to its defensive style architecture in some parts of the building, its really more of a stately home. The first part of the castle was built during the early 1300's when a sandstone keep was built by the monks of Arbroath Abbey. 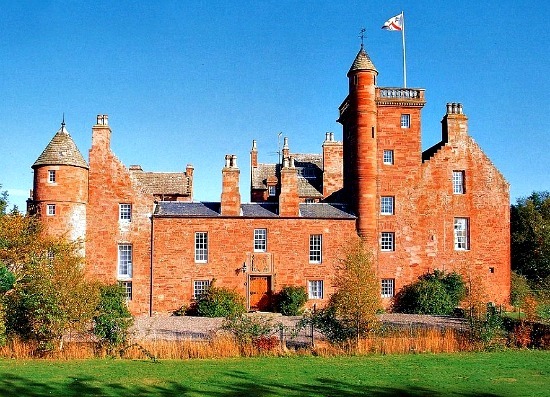 By the 1530's the castle was in the hands of the de Maxwell family, who remodelled the whole castle around a central courtyard, the purpose of which was to entertain King James V.
After the de Maxwell family took possession of the castle the lands reverted to the Abbot of Arbroath, who later became the Cardinal and Chancellor of Scotland. After his murder at saint Andrew's the remaining abbots and monks were reported to have taken all of the valuables from the church there and hid them in the walls of Ethie castle for safe keeping. In 1665 the castle was bought by the Carnegie family who held it until 1928. During this time the 7th Earl was a Vice Admiral and commanded with Nelson at the Battle of Trafalgar in 1805. He changed the whole castle to a country style residence which is the style that can be seen today. In recent years it has been renovated and modernised and now hosts various functions such as weddings. So is Ethie Castle Haunted? There are thought to be several ghosts that reside at the castle, with the most well known being the spirit of cardinal Beaton. He was a powerful figure in the catholic church and was known for his poor treatment towards protestants. During the year of 1545 he arranged for the arrest of a protestant preacher name George Wishart. The arrest led to a trial which saw the execution of Wishart, an act which would lay the foundations for Beatons downfall. Less than a year later he had annoyed enough people to cause a group of armed men to storm his residence, killing his porter along the way, and eventually getting to him. He was murdered and his corpse badly mutilated, it was then hung out the window for all to see. This is the main explanation behind the ghost seen by many within the castle walls. It seems he always appears as a faint, shadowy figure but is more well known for the noises he creates. He was believed to have a bad leg when he was alive and this is supposed to be heard in the ghostly footsteps made in the corridors late at night, with dragging and clumping sounds accompanying the steps. There are various other ghosts believed to reside here, but there isn't really a story for them and their identity remains unknown. But of course what castle would be complete without its very own "Grey Lady". I know every castle, mansion and church is supposed to have one, but you cant argue with the shear amount of claims from people who have seen this spirit. Always described as a dark mist like figure wearing some sort of gown, though on the rare occasions she is seen it is always just gliding along the floor before quickly vanishing into nothing.